1. National Museum of Natural History at the National Academy of Sciences of Ukraine. “Who vacations in Ukraine?” was the reaction of people I spoke with about my upcoming travel plans. People are often surprised at the idea of travel to less advertised parts of the world. And if those places are in the news for political unrest, you’ll get some baffled faces when you tell them you’re planning to go there. But much like everything I do in life, I don’t judge a person or a place before I get to know them a bit. My daughter’s class at school is a melting pot of cultures, and one classmate’s mom is from Ukraine. When she posted pictures on social media, of her homeland, this past summer, I was hooked on the idea I had to visit Ukraine. Because I discovered on a recent trip to Sofia, Bulgaria what a great travel partner my daughter is, I decided to make this another girls trip. Ukraine is a large country in Eastern Europe and the 32nd largest country in the world. It is vast in size and offers visitors diverse cultures and landscapes. There are plenty of attractions and things to do in Ukraine. Largely unknown to the world, Ukraine’s main highlights include quintessentially Slavic cities, impressive cultural heritage and UNESCO-listed sites, and stunning natural areas. Among the fascinating destinations, Kiev, Ukraine’s capital, is the most remarkable city with its large gold-domed cathedrals. 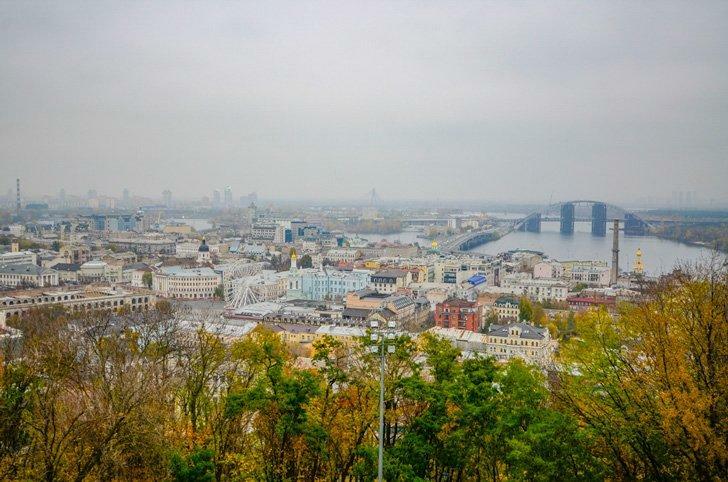 Travelling to Kiev from Germany on a budget is easy by flying Wizzair from Frankfurt directly to Kiev. The flight is only 2 hours, and it is quite comfortable. On any given day you can find good deals, but if you watch the website carefully, you can score some real bargains. We were able to fly round trip, priority for under 200 euro. Because Kiev is a cheap destination in Europe, good, affordable lodging is easy to find. For our three night stay, we rented Andrei’s apartment for just $100. The apartment was centrally located, quiet, clean, and equipped with everything necessary for a short or more extended stay. If you’ve never used AirB&B before, sign up using our link and get a free credit towards your first stay. 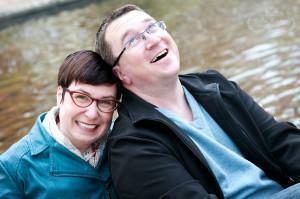 Andrei was extremely fast responding to messages and helpful once we got to Kiev. For a fee, he waited for us at the airport and even went ahead and got me a Ukrainian local cellphone SIM card. It was a very positive experience. 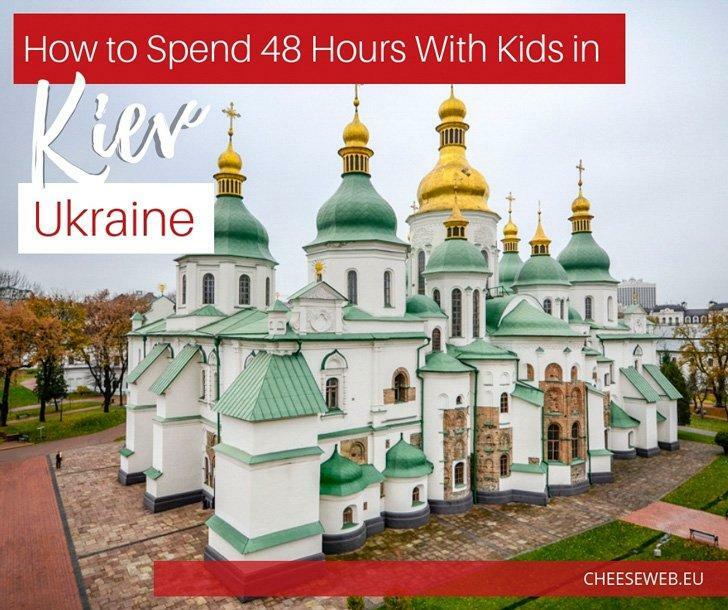 When I started my research on what to do in Kiev, with kids, I was not expecting to find so many options. Kiev is riddled with fun and interesting activities for the young and young at heart alike. The National Museum of Natural History is one of the largest scientific research museums of its kind in the world. It is a complex comprising five museums: geological, paleontological, zoological, botanical, and archaeological. There are approximately 30,000 exhibits in 24 halls with a total area of 8,000 square meters. We spent an entire morning in this vast museum, getting lost in the multitude of exhibits and especially admiring the many realistic displays of animals in their habitats. The only downside to the museum is none of the descriptions are in English. But, being natural history museums buffs we got the gist of it all. One thing that impressed me personally was just how many kids were visiting either as a school trip or with their parents. It’s always lovely to see kids interested in science. 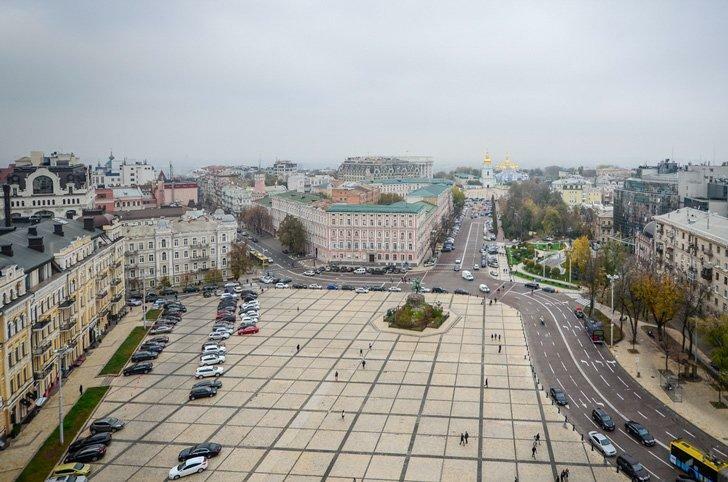 Kiev’s main square has had its share of political events. The 1990 student “Revolution on Granite,” the 2001 “Ukraine without Kuchma,” the 2004 Orange Revolution, and the 2013–14 Euromaidan, culminating with the Ukrainian revolution of 2014, when a series of violent protests involving citizens, riot police, and unknown shooters, ended in the ousting of the elected Ukrainian President, Viktor Yanukovych, and the overthrow of the Ukrainian Government. These days, the main square is a laid back and relaxed hangout spot full of street vendors and street food eateries. It is also where you will find entertainers trying to make money by posing for pictures with you or with their animals such as doves or monkeys. Be aware you will have to pay for this, and there is a degree of bargaining involved. To learn more about the area, you can book a spot on a small group walking tour or book a private guide to show you the sights. 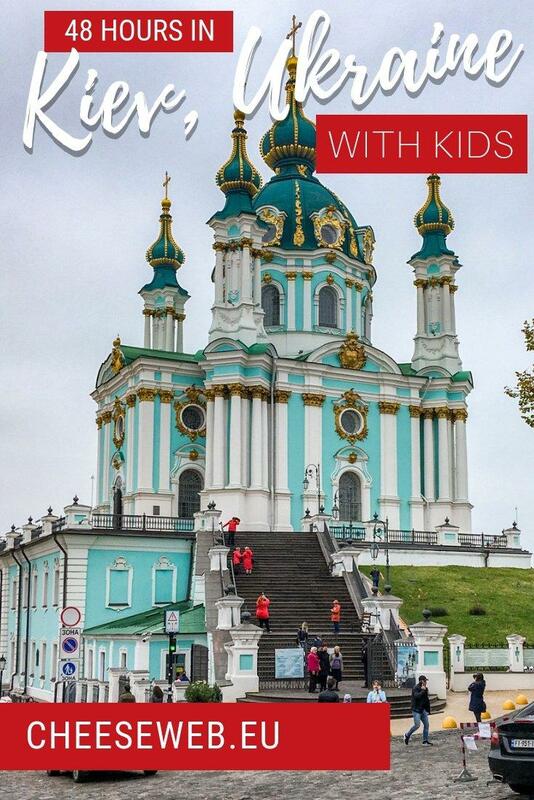 Saint Sophia Cathedral is a UNESCO site and one of the top attractions in Kiev with kids or without! Designed to rival Hagia Sophia in Constantinople, Kiev’s Saint-Sophia Cathedral symbolizes the ‘new Constantinople,’ capital of the Christian principality of Kiev, which was created in the 11th century. 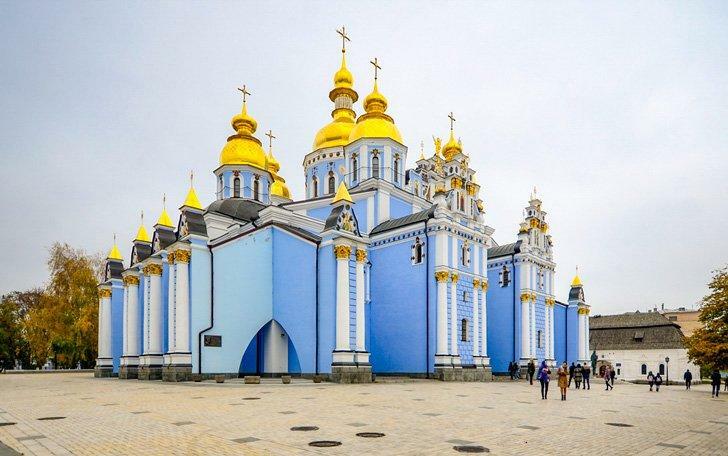 The cathedral is a UNESCO World Heritage site, and on the 21st of August 2007, it was named one of the Seven Wonders of Ukraine, based on votes by experts as well as the internet community. The view from St. Sophia’s bell tower is worth the climb. There is a fee to enter the cathedral domain as well as the bell tower. I highly recommend the tower visit as it offers exquisite views of the cathedral as well as the square in which it resides. Photography is not allowed while inside the cathedral. You can book a tour of Saint Sophia and St. Michael’s Monastery and skip the lines. St. Michael’s Monastery is one of the best things to do in Kiev, Ukraine. Looking from Saint Sophia’s it’s impossible to ignore the gold-domed blue church at the other end of the boulevard. 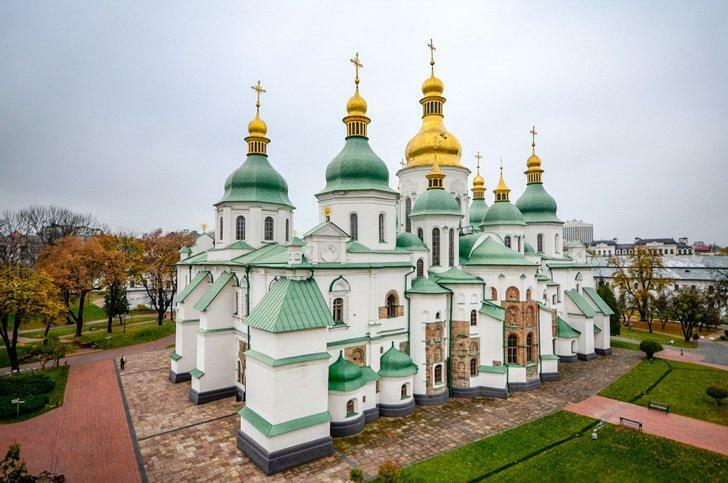 This is St Michael’s Monastery, named after Kiev’s patron saint. As the intensely golden cupolas imply, this is a fresh (2001) copy of the original (1108), which was torn down during the Soviet regime in 1937. The church’s fascinating history is explained in great detail (in Ukrainian and English) in a museum in the monastery’s bell tower. No fee is charged to visit the monastery grounds and photography is not allowed while indoors. You will also notice that the majority of the women have their heads covered inside the church. While it is an appreciated gesture, covering the head is not mandatory. 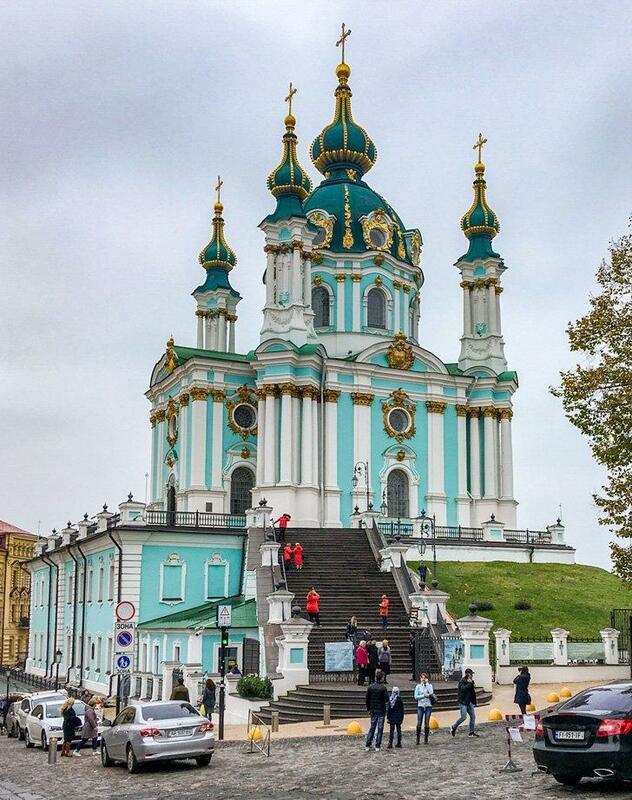 St. Andrew’s church is another beautiful place to visit in Kiev, Ukraine. The Saint Andrew’s Church is a major Baroque church. To our disappointment, the interior is being renovated at the moment so entering the church was not possible. You still have to pay a minimal fee to enter the church grounds. Do visit anyway as the church is built on a hill offering beautiful views of the city of Kiev. St. Andrew’s church also offers stunning views of Kiev. Do not miss the chance to observe the “Chasing Two Hares” statue right outside the church. The statue was erected to honour the satirical Soviet film “Chasing Two Hares,” and it has become wildly popular with locals and tourists alike. You will see like with many statues you have to rub different parts for good luck. A visit to Mykola Syadristy Microminiatures Museum is fun for kids and adults alike. One of the highlights of our visit to Ukraine was visiting the Microminiatures Museum. 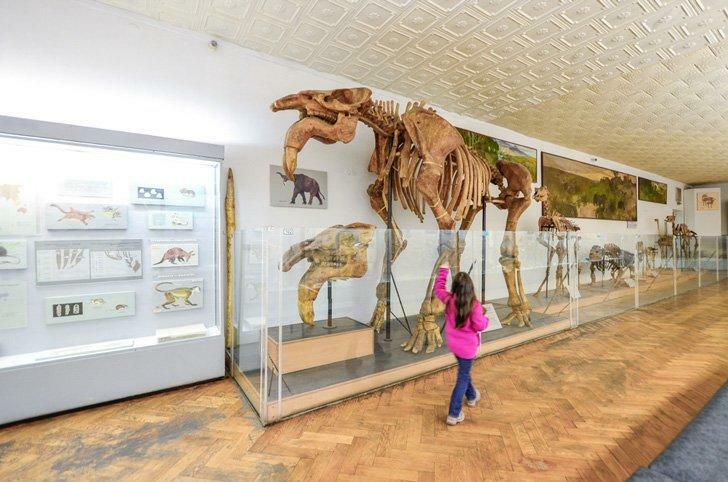 Never in our travels have we seen a museum for all things tiny. And by tiny, I mean 500 times smaller than the thickness of hair. Micro art museum of Mykola Syadristy is situated on the Kyiv Pecherska Lavra territory. Widely considered the world’s best micro miniaturist, Mykola Syadristy has a lifetime’s worth of tiny creations on display in this museum. Portraits, flowers, books, instruments, a chess set, all sized at just microns. The museum itself is tiny, and you have to take turns looking through the microscopes. 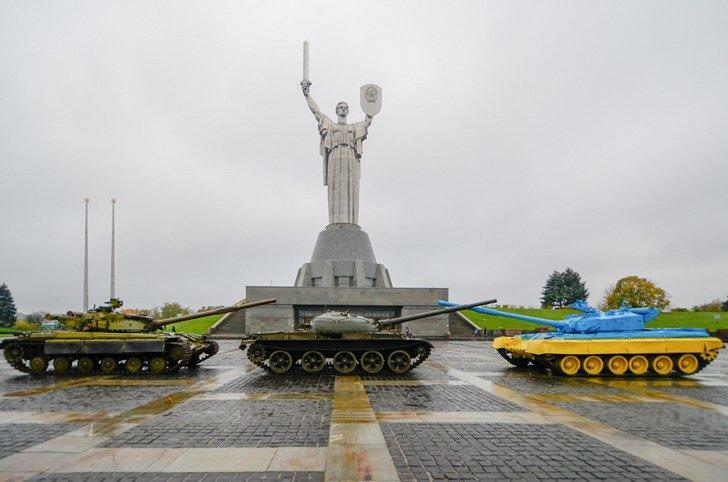 The Motherland Monument watches over Kiev, Ukraine. Standing proudly at a little over 100m the Motherland Monument is dedicated to the fallen heroes for the Soviet Union. It is part of the complex that is the Museum of the History of Ukraine in the WWII. We enjoyed strolling the museum grounds as it is riddled with war machines, planes, and helicopters. For a small fee, you can visit the grounds for a closer look and even enter some of the vehicles. 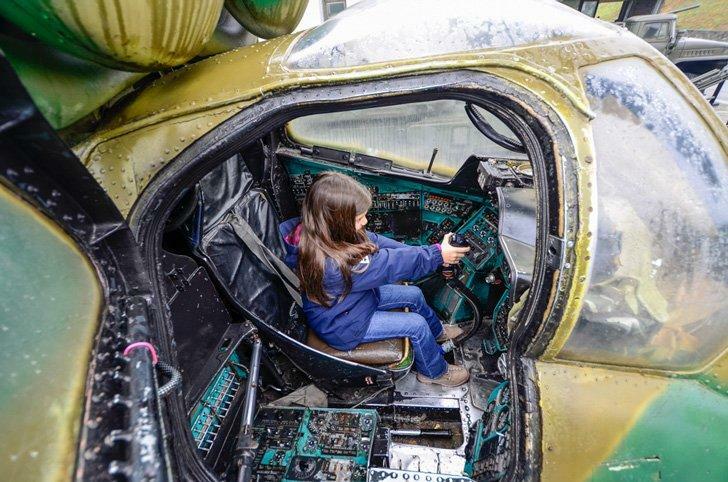 My daughter was fascinated and insisted she board an old Soviet helicopter. The entire area is impressive, and the sheer size of the statue is jaw-dropping. It is the 12th largest statue in the world. By comparison, the Statue of Liberty in NYC is only the 42nd in size. 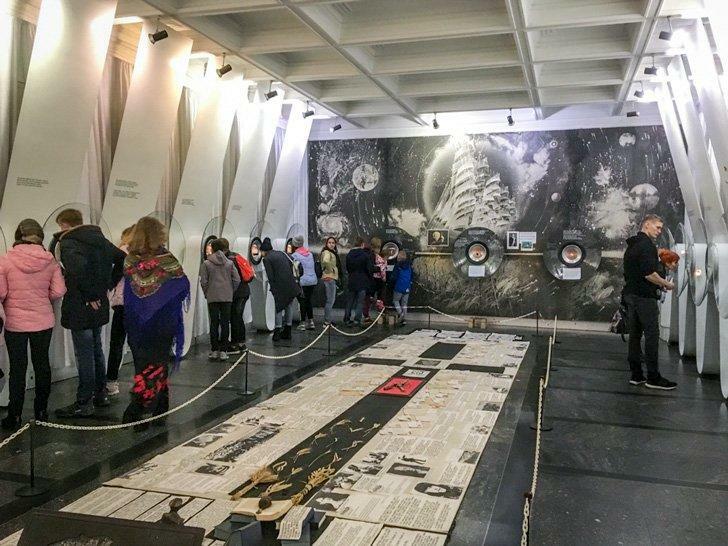 The Museum of The History of Ukraine in World War II has plenty to offer history fans. You can book a combined tour of the WWII Museum and Pechersk Lavra here. 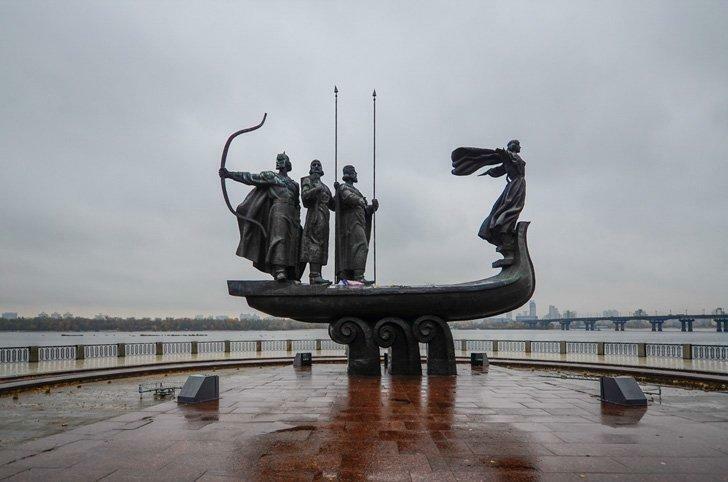 According to legend, ancient Kiev was founded by brothers Kyi, Schek, Horyv and their sister Lybid. In the Russian chronicles of the 11th and 12th century, it is said they were charmed with the nature flourishing at the banks of the Dnipro River and decided to stay and form a city here. The statue, erected in 1982, quickly became a symbol of Kiev. There is also a beautiful tradition related to this monument. On their wedding day, newlyweds visit and leave flowers at the monument to a long and happy married life. It is believed, if a just married couple can throw a bouquet in the boat, their marriage will be successful. 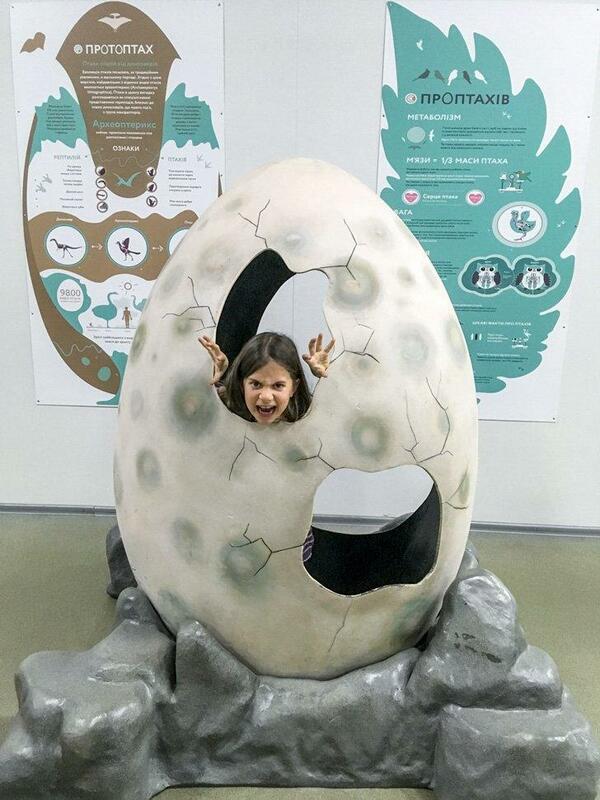 One thing I did not expect to find in the city of Kiev was the Experimentarium, a place where the young and young at heart can experience hours of interactive fun. Here visitors can explore a maze made entirely out of mirrors, see dozens of optical illusions, sit on a chair of nails, see how tornadoes are formed, play with magnetic forces, draw through a mirror, and even listen to music with their teeth. We spent hours having the time of our lives. We were pleasantly surprised to find all the experiments are explained in English. The Experimentarium is popular with school groups so at the time of our visit it was full of kids. However, this was not a problem; there are plenty of experiments to go around, so nobody has to wait in line. 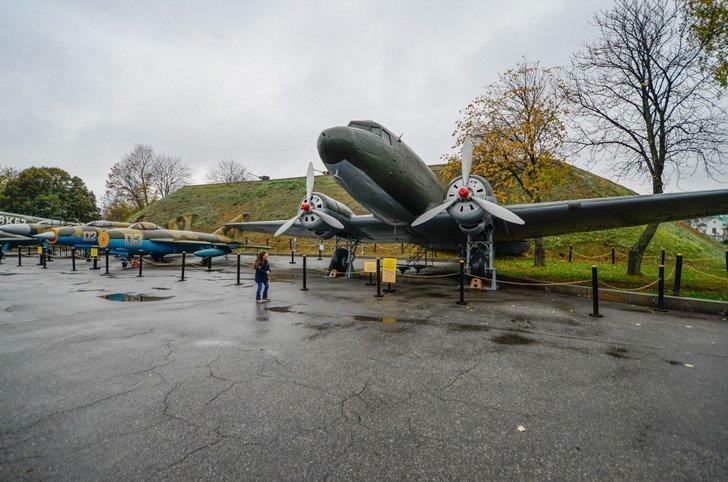 The State Aviation Museum is located next to Zhulyany Airport in Kiev, and it displays a collection of old Soviet planes and helicopters. You can even get inside the cockpit of some of the aircraft. You can book a 3-hour guided tour of the aviation museum to learn more about the aircraft and military history. We were looking forward to visiting this museum but found out that on Mondays and Tuesdays it is closed. We were able to squeeze a few photos through the fence promising to visit next time. 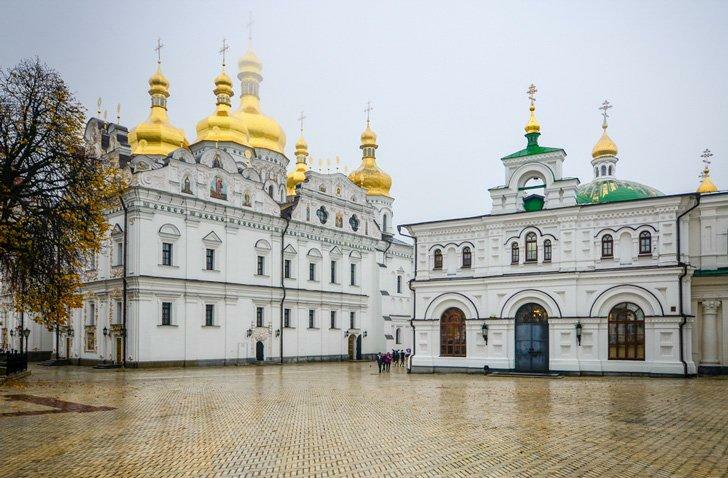 The Pechersk Lavra is a UNESCO site in Kiev and a top attraction in Ukraine. Orthodox pilgrims and tourist alike flock to the Lavra, set on the grassy hills above the Dnipro River. The monastery’s cluster of gold-domed churches is a feast for the eyes, the hoard of Scythian gold rivals that of the Hermitage, and the underground labyrinths lined with mummified monks are exotic and intriguing. For pilgrims, the rationale is much more straightforward: to them, this is the holiest ground in the country. You can easily spend an entire day here, but we could only skim the surface of this impressive UNESCO World Heritage Site. You can explore the UNESCO-listed Kiev Pechersk Lavra on a comprehensive 2-hour walking tour with an expert guide. In addition to the monastery, you also get to visit the mysterious Lavra caves. Check out more great guided tours and things to do including the best day-trips from Kiev on our favourite activity booking site, Get Your Guide. As far as I could observe Kiev is the center of a cluster of satellite cultures, and that reflects wonderfully in the local cuisine. 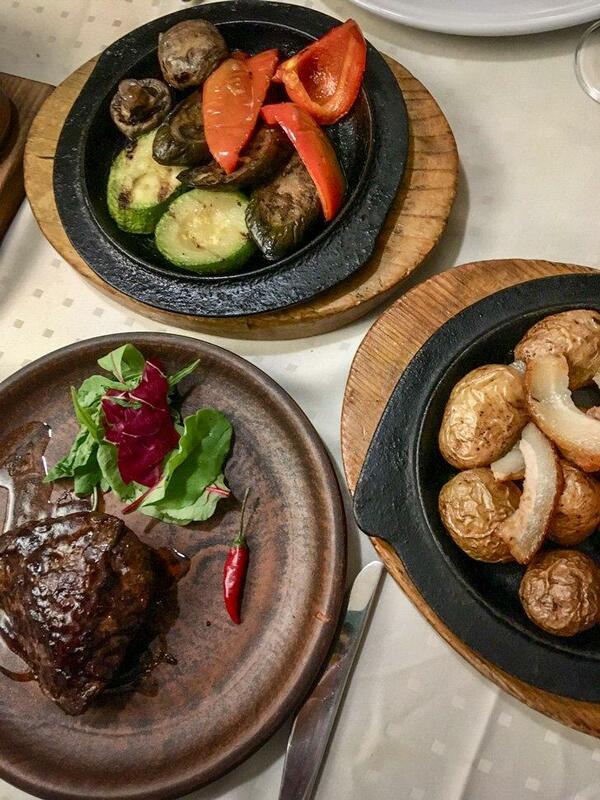 Three of the restaurants in Kiev we visited stood out and impressed us with fantastic food. Pervak is a Ukrainian folk Restaurant in Kiev. 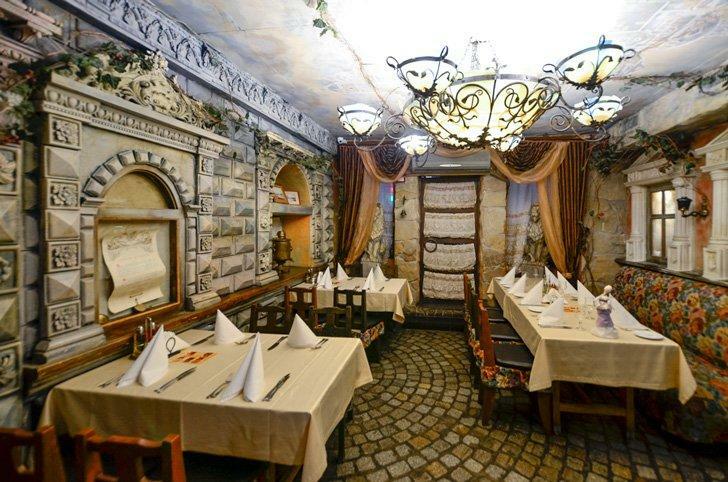 Pervak, one of the best Ukrainian folk restaurants in Kiev, and is located in the heart of the capital. The interior takes you back in time to early 20th-century Kiev with great old-timey décor. The restaurant is on the site of a famous merchant’s house, and it includes the showing of silent movies. 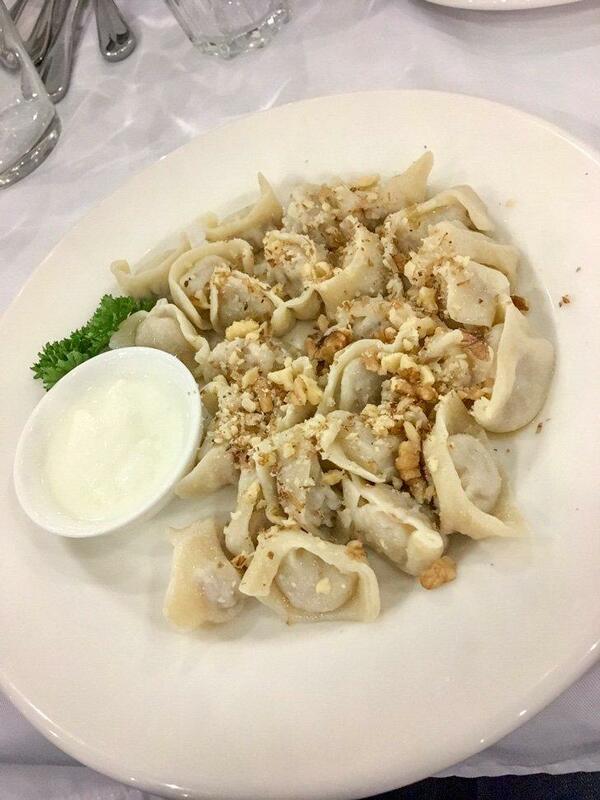 They offer an excellent range of freshly cooked dishes of Ukrainian cuisine, served by a friendly staff in traditional costumes. The prices are in the higher range but still very affordable. Dinner for two cost us $40. The Georgian House was located across the street from our apartment, so it was effortless to get to. One of the countries on my “must visit” list is Georgia so imagine my joy when I saw that I could taste some traditional Georgian cuisine. 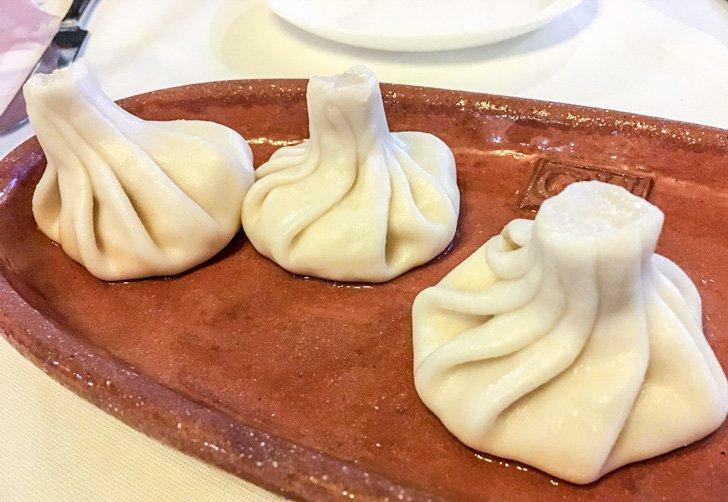 Here I was able to try the famous Georgian khachapuri and khinkali dishes. The restaurant is small, but we managed to get a table without a reservation. The prices were very affordable. Dinner for two cost us about $15. 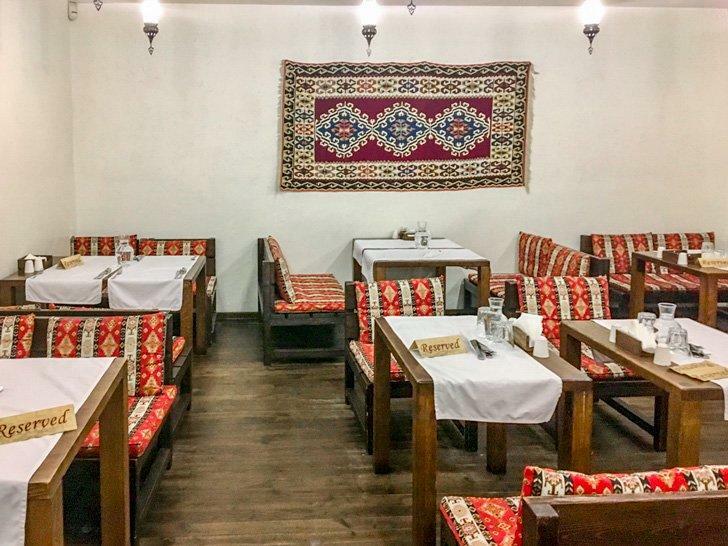 Musafir was a treat for the taste buds serving Crimean-Tatar cuisine. Here too it’s best to have a reservation if you plan on dining later in the evening. Because we arrived early, we managed a table without a reservation. The food is gorgeous, plentiful, and served at lightning speed by a friendly and young staff dressed in traditional outfits. We were also lucky enough to have live music. I cannot recommend this restaurant more. My mouth is watering just thinking about it. Dinner for two cost us $18. The local currency in Ukraine is the hryvnia. 1 Ukrainian hryvnia equals 0.032 euro and 0,036 dollars. Be prepared to travel with a stack of cash. Credit cards are accepted in restaurants and the more upscale stores but not in mom and pop eateries and smaller stores — also, no card activity in the stores in the underpasses. Google Maps is a crucial navigation tool. Very few signs are in English making it difficult to navigate the city without GPS. Buying a SIM card with a local number is recommended, so you do not incur roaming fees. I bought a Vodafone SIM for a few dollars then put $4 on it which gave me unlimited internet and 35 min of calls. There is good LTE coverage all around Kiev. UBER operates in Kiev making visiting sites easy and affordable. All our rides did not cost more than $5. All the drivers were professional, but none spoke English. On Tuesdays, museums are supposed to be closed, but we visited the Microminiatures museum on a Tuesday so it can be hit or miss. Regarding safety, I had no concerns or fears of travelling the city with my 8-year-old daughter. Be prepared and know how to navigate to sites in advance as not many people speak English. Covering your head inside holy sites (for women) is appreciated but not mandatory so do not feel singled out if you are the only one there without a head cover. Kiev doesn’t have many pedestrian traffic lights. Most of the road crossing happens via underpasses that have been turned into labyrinths of shops. I got lost in them once or twice, so my advice is to pay attention. Based on the information I found online before our trip, I expected to like Kiev, but I did not expect to love it. 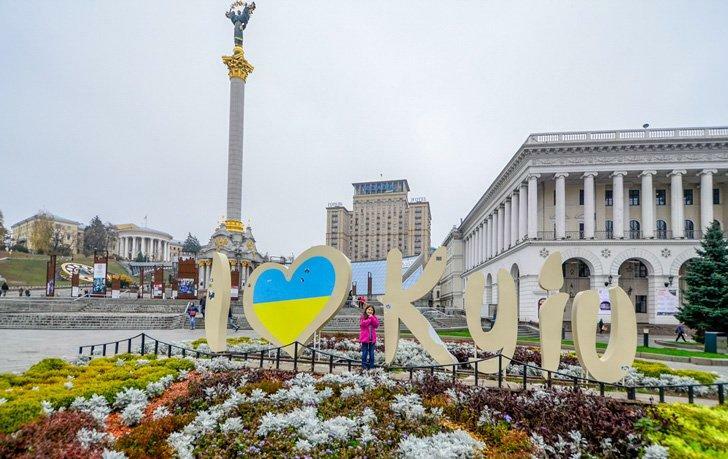 With chic restaurants, cafes, and posh shopping, Kiev is striving to attract tourists from all over the world so do not wait a minute longer and plan your next trip to this beautiful and underrated destination.